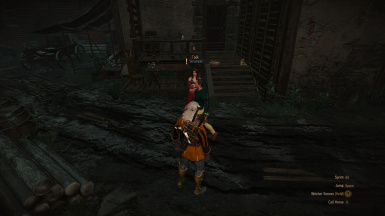 Hides interaction and name for NPCs with no interesting behavior (most of generic npcs). Fix issue with interactions not displayed with Witcher's senses activated (again!). Fix issue with interactions not displayed with Witcher's senses activated. Fix issue that was breaking interactions with quest-related items. Fix issue with some quest-related npcs no more interactibles. This mod hides the name and action for NPCs which are useless. 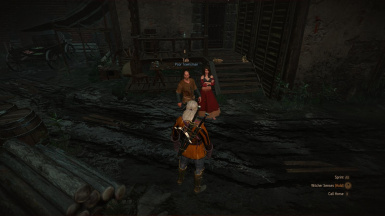 NPCs are considered useless if they have no interaction scene. The mod does not only hide the HUD, it disables the interaction so the targeting system should adapt by itself. 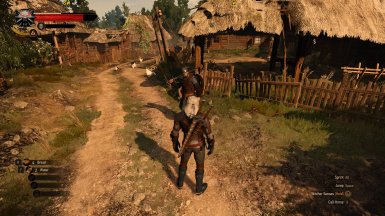 Look at the screenshots for a better understanding: in the first one, it shows the vanilla behavior (when a generic townsman walks next to Geralt and an NPC with a quest, the targeting system chooses the closest entity, aka the townsman). But with my mod (next screenshot), the townsman is completely ignored! Please note that the system is not perfect (you may see some NPCs with their name, this is mainly because they may be used in some quests, so at some point of the story you'll have to talk to them, well I guess). But I think the actual result works pretty well. In case you want to check something (or you're facing a case the mod hides a name it should not), if you activate the Witcher's senses every name and interaction will be back to display. First you have to choose between 2 versions, depends if you're using the mod Friendly HUD or not. Not mandatory, but you should also use the Unification patch for 1.31 and 1.31GOTY. CD Projekt for the Witcher games. wghost81 for Friendly HUD and the Unification patch for 1.31 and 1.31GOTY (amongst many others great mods! ).